TACOMA — The old board game Battleship is taken to a new level when the captains of the Washington Cascade Column take to the water, viagra dosage as they did Monday in Tacoma. "All of us were guys who threw rocks at plastic ships and never got over it, disorder " said Phill Lowe, medications of Tumwater, one of the founders of the Puget Sound-area club. Lowe and four others started it in the fall of 1997. "It’s still about boys who want to play with toys and beat them up," he said. has laid off six full-time and two part-time employees – out of a 25-member staff. The layoffs come soon after new executive director Tom Bancroft replaced Kathy Fletcher, who retired after heading up the group since it was founded more than 20 years ago. “I intend to stay in the game and put skills and passions to some constructive use,” said Mike Sato, PPS’ former communications director and a 20-year employee who lost his job. Also, check out Mike’s personal labor-of-love effort to keep posting Puget Sound news (hey, THAT sounds familiar!) at his new Salish Sea News & Weather blog. Good luck, Mike! But sometimes the answer can be heart breaking when someone is in great distress and does not know where they are. Not all boats carry a GPS or charts. I have put together a test for you Local Knowledge Experts to test yourself. The test is based on a copy of the Coast Guard Coxswain Local Knowledge and Chart Exam. 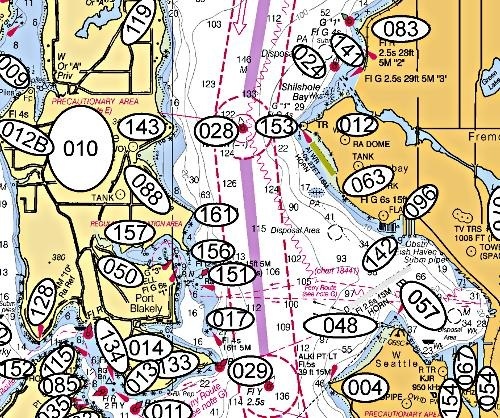 Last year a friend send me a list of the 162 points and some of the other Local Knowledge that a Coxswain needs to know before being trusted in command of a Sector Puget Sound Coast Guard Vessel. How hard is the exam? Lets ignore for the moment the 600++ page Crew and Coxswain Manual and other training and just look at the “Where Are You?” part. because there will be some 250 wooden watercraft from cedar-strip canoes to the heartstopping 84-foot schooner Martha jammed into the harbor, all swirled in an atmosphere of delirious festivity. Troubling, because authenticity turns out to be a deeper issue than you imagined, and you can’t predict where the first stirrings of a craving for it will take you. I’ve been prowling the festival for 10 years. Thanks to the inspiration of what I learned there, four years ago I completed my first sailboat — a 14-foot sailing dinghy accurately named Far From Perfect, and registered her in the ’07 show. This was where I had my first authenticity scare. In the final flurry of construction I realized I’d forgotten about deck cleats, minor morsels of hardware that secure the dock lines. I pawed through a drawer in my shop and found some plastic cleats salvaged from a kayak. Well, why not?—they were large enough for a lightweight dinghy and seemed perfectly functional. After my boat was settled in her slip at the festival, I had time to walk around, and after a few hours came the sudden quake of realization: Far From Perfect sported the only plastic cleats, in fact the only visible plastic anything, in the entire show.